Car Differential is necessary when the vehicle turns, making wheels that are traveling around the outside of the turning curve roll farther and faster than the others. A gear train with three shafts that has the property that the angular velocity of one shaft is the average of the angular velocities of the others or a fixed multiple of that average. Input torque is applied to the Crown Wheel (Gear), which turns the Rotating Cage. 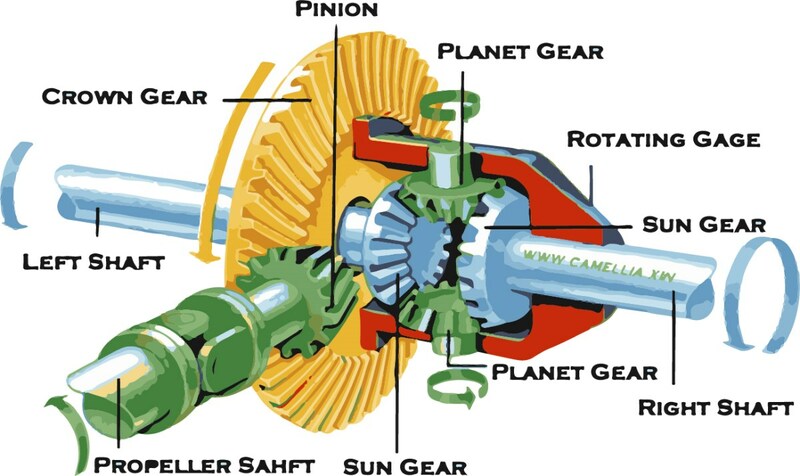 The Rotating Cage is connected to both Larger Gears (Sun Gears) only through Small Gears (Planet Gears). Torque is transmitted to the Sun Gears through Planet Gears. If the resistance at both wheels is equal, such as two wheels have no obstacle on their own trails or when the car is running straightly, the Planet Gear revolves without spinning about its own axis, and both wheels turn at the same rate. If the Inner Sun Gear encounters resistance, Planet Gears spin as well as revolving, allowing the Inner Sun Gear to slow down, with an equal speeding up of the Outer Sun Gear. There are Front Differential and Rear Differential. Central Differential is also necessary for All Wheels Drive car when turning on dry pavement, allowing front wheels to rotate at a different speed than the rear wheels. Differential Locking is designed to overcome the chief limitation of a standard open differential by essentially "locking" both wheels on an axle together as if on a common shaft.